Just Another Day...: 33 Weeks! 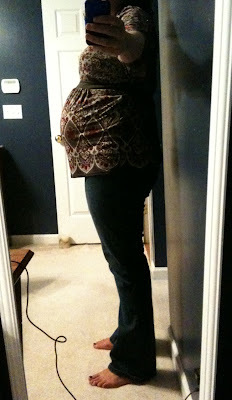 Well, it's been a few weeks since I've posted a pregnancy update, so I thought I'd hit ya'll with 33 weeks. This way, I can continue to post every 2 weeks (at 35, 37 and 39 weeks). Chase should be here at 39 weeks, so believe it or not, we're almost there!!! Wedding rings on or off: Still on, and I can't believe it! I'm pretty sure they came off around 6 months when I was pregnant with LO. Here I am 8 months pregnant with Chase and rings are still on! WOOT! Food cravings: Chocolate milk, Little Debbie Star Crunch cookies, Fruity AND Cocoa Pebbles (separately, not mixed together of course -- that would be gross!). Energy level: I ain't gone none. No surprise there, right? Mood: Anxious. It's hard to believe in less than 6 weeks, Chase will be here. I guess with most pregnancies this time should be an "excited anxious" but with me, it's a very NERVOUS anxious. I'm excited to finally see my precious baby boy for the first time, but I'm so very nervous about the roller coaster ride we'll be on once he's here. I'm worried about how LO will handle everything. Her WONDERFUL Aunt D will be her primary caretaker while hubs and I are at the hospital for Chase's birth. I know she'll have fun with Aunt D, but LO has NEVER been apart from hubs and I for more than one night. I'm worried she won't adjust well to not having mommy and daddy around all the time. Maternity clothes: 24/7, of course! Size of baby: This week he weighs a little over 4 pounds and is over 17 inches in length. Baby's changes: He's rapidly losing that wrinkled, alien look and his skeleton is hardening. What I've been up to: We are so very happy to have FINALLY nailed down a property for our stay in Charleston. It's about a 10 minute drive to MUSC, but it's in a lovely neighborhood and really works out great for LO. I did enjoy a lovely baby shower hosted by my dear sister and fellow pregnant friend last week. It was a small, intimate gathering of just a few close friends and was very special. We're also planning to kind of put Chase's room together. Hubs is working on putting the crib together, and I need to organize the baby stuff we've received. Part of me is nervous in putting together his room because of the potential risk that he won't be coming home with us, and we'd have an empty nursery to take apart. But I'm trusting in God and am continuing to pray for Chase's health and safety through his first surgery. I know my God is more than able to do exceedingly more than I could ever ask or imagine!!! I think I've mentioned this on here already, but I'll go in to MUSC on Sunday evening, October 25th and my induction will start Monday morning, October 26th. God willing, Chase will be here on October 26th!!! Update: I finally got myself motivated enough to take my 33 week pic! I know, you can hardly contain your excitement, right? Well, here ya go. I must say, the best part of this pic is the pretty little iPhone the picture was taken with! :) Oh, and let's not discuss the fact that the shirt is barely able to contain my growing belly NOR the fact that my blue jeans are screaming for relief from covering my massive thighs!